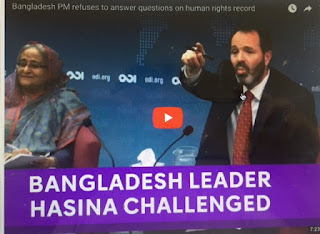 Is the reputable, and supposedly independent, Overseas Development Institute helping the Bangladesh government to enforce here in London the draconian restrictions that journalists experience in Bangladesh? And is it, in light of how ODI dealt with a question from a Channel Four News journalist at the meeting itself, protecting the prime minister from having to respond to tough questions? When I applied a week ago to attend the ODI event at which Sheikh Hasina, the Bangladesh Prime Minister, was due to speak. I got a very welcoming response. from Ben Tritton, the event organiser. "We'd be delighted to welcome you to ODI" he said. So I was rather astonished to receive an e-mail on Monday morning, the day before the talk, disinviting me from the event. "Apologies but over the weekend we have received a large number of high level responses and this event is highly over-subscribed. We will therefore be unfortunately not able to welcome you to the event"
"Could you please clarify whether you have allowed the Bangladesh delegation/government/representatives to vet the list of those who can attend the talk." "I am afraid I cant comment at all on that"
This is as close to a confirmation as you will ever get without the ODI saying "yes". If they hadn't allowed the Bangladesh government an ability to vet the invite list, the ODI would surely have just denied it. In Bangladesh, media censorship has become increasingly restrictive. The government refuse to allow journalists from certain independent newspapers to attend government press conferences; the military intelligence agency has ordered large companies not to advertise in two major newspaper's reducing their advertising income by over one third; the prime minister has denounced a newspaper editor for publishing stories that were seeking to "destroy the country.” Government party activists have filed dozens of criminal cases against the same newspaper editor; dozens of journalists and editors have been arrested under the vague and arbitrary Information, Communication, Technology and Communication Act; and there is a high degree of censorship and - rather obviously - self-censorship. Televsion is particularly controlled. The ODI must know about all this so why would it participate in apparently allowing the Bangladesh government to dictate who could and could not come to the meeting? In addition, of course, and more significantly, the ODI did everything to prevent Channel Four News to ask a difficult question to Sheikh Hasina about human rights issues in Bangladesh.